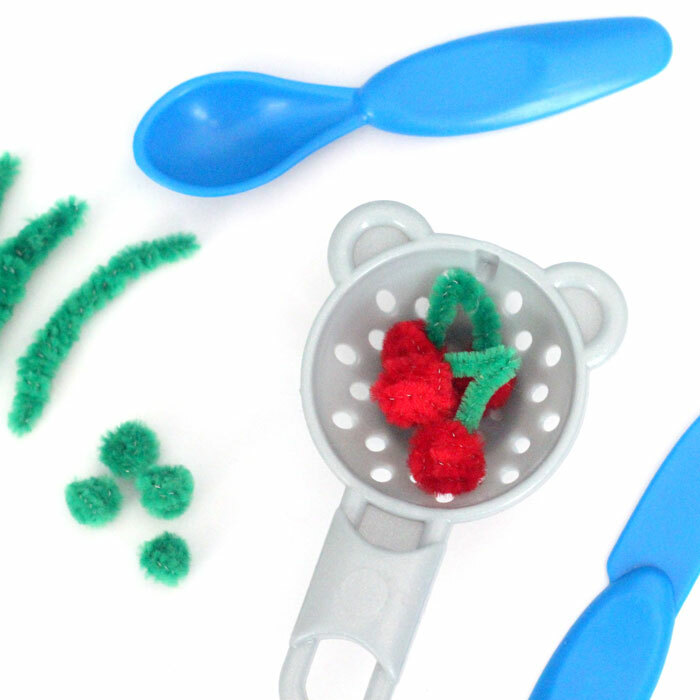 Make this adorable and easy pretend play food that also happens to be very healthy! A great way to encourage our children to eat healthy is to do so when they play as well. 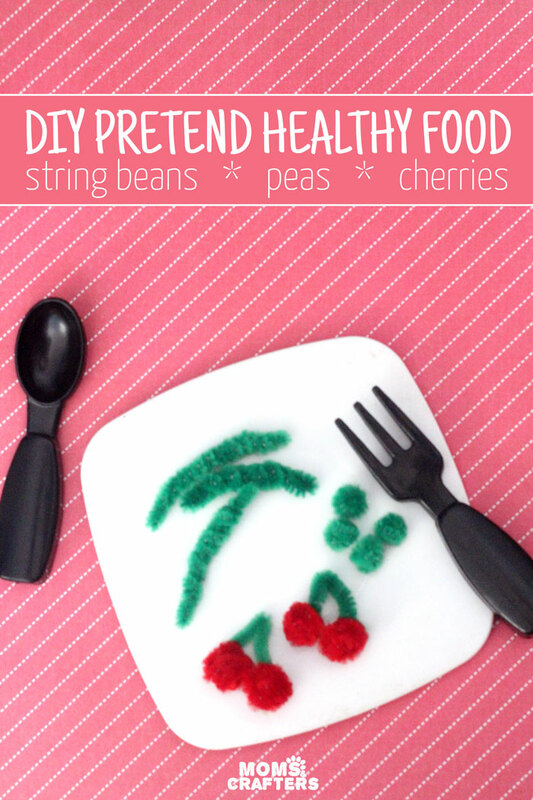 These pretend string beans, peas, and cherries are really easy to make with step by step photos. If you’ve noticed, M really enjoys playing with pretend food lately. He’s at that age where pretend is his world, and encouraging it is a healthy thing to do. We recently got him this fun, inexpensive play kitchen, and he adores it. We added on to that some fun pretend food and dish sets (including this shopping basket full of food, this stir fry set, and the dishes from this set that we’ve had for a while.) I then made for him some more grocery shopping toys and offered the free printable groceries for my readers here. He really enjoys going shopping with his shopping cart. As a stay-at-home-tot, it’s hard to entertain him, and this is what keeps him busy for much of the day. However, while his pretend play sets offered him some favorite foods (like milk, broccoli, and an apple) they did not have his absolute favorite: string beans. They even include a yellow cup similar to the one I use to pop his string beans in a microwave, and the microwave to do so! 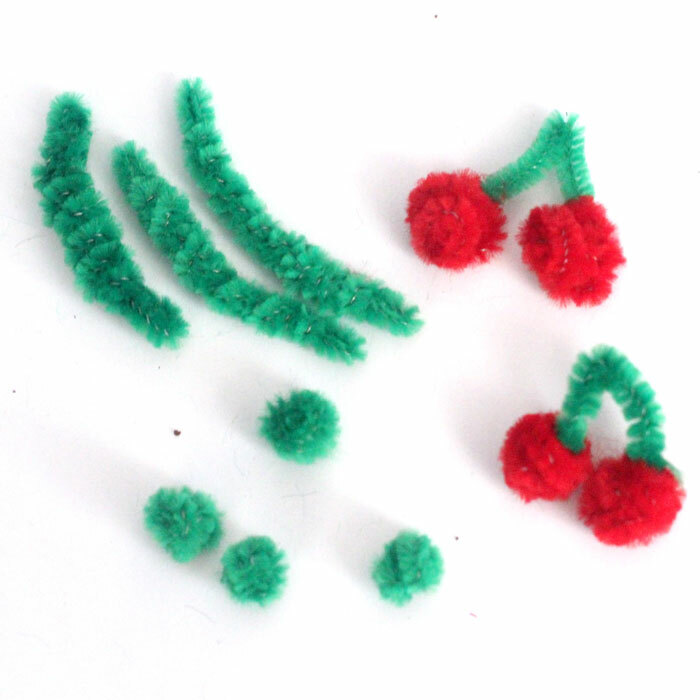 So, I decided to finish it off with some play string beans made from pipe cleaners. Once I was at it, I also made peas, which he loves as well. 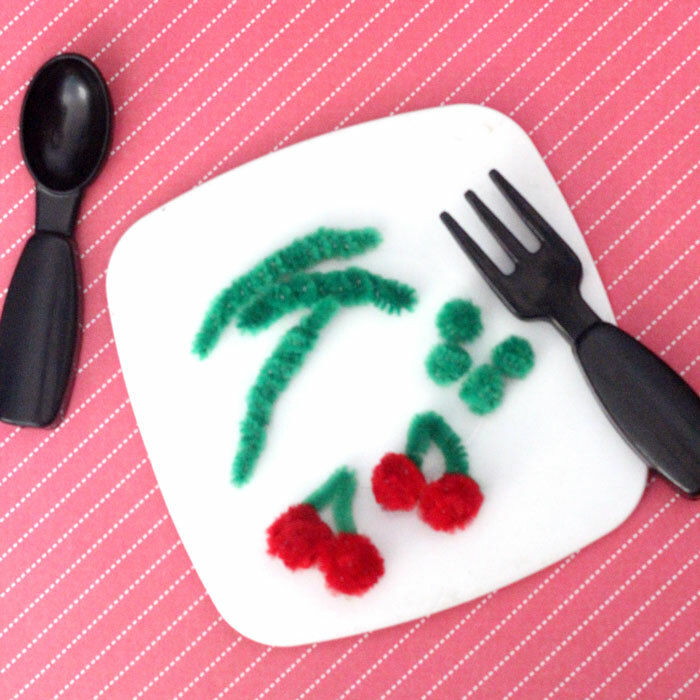 I added in the cherries just because they’re cute. I hope you enjoy this fun tutorial! Please be aware that the peas would definitely be a choking hazard for children under age 3. I’m not sure about the others. Wire cutter or strong scissors. 1. For the string beans: Bend down the tip of your pipe cleaner. 2. Bend it again to form a section about the length that your string bean would be. 3. 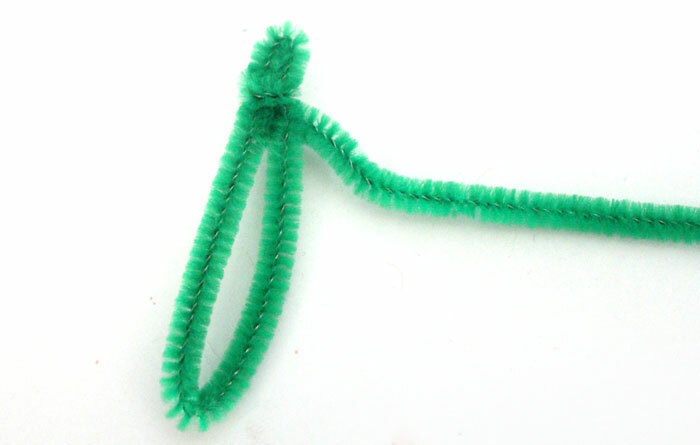 Start wrapping your pipe cleaner around that middle section, starting from halfway down that first bent-down end. This forms a clean edge that isn’t sharp. 4. Continue wrapping focusing on doing a little extra in the center to make it thicker. 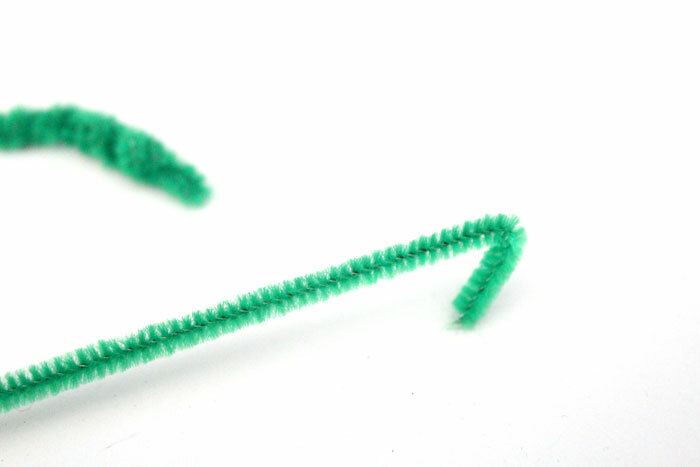 Wrap until your each the end of your pipe cleaner At that point, simply tuck the end into the body to hide sharp edges. 5. 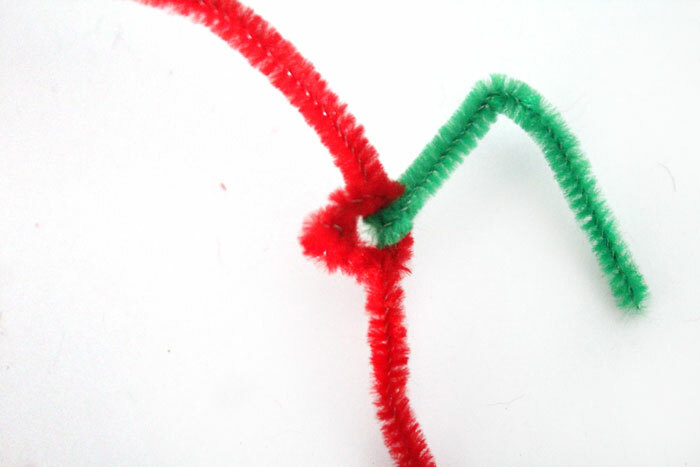 For the cherry: Start by tying a tight know in the center of a red pipe cleaner, and a loose knot over it, as pictured. 6. 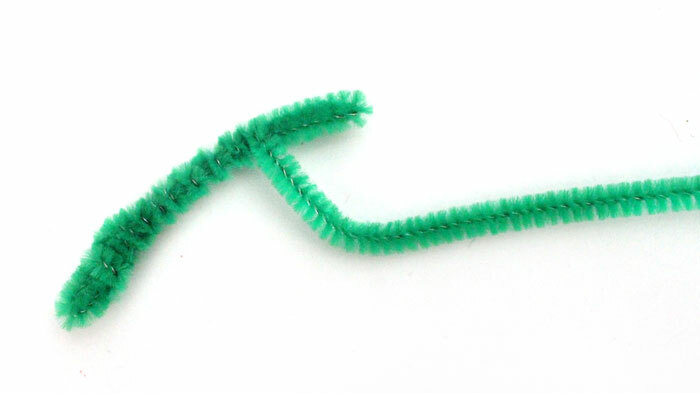 Cut a smaller bit of green pipe cleaner for the stem. Bend it into a V shape. Wrap one end around the loose knot of the cherry. 7. 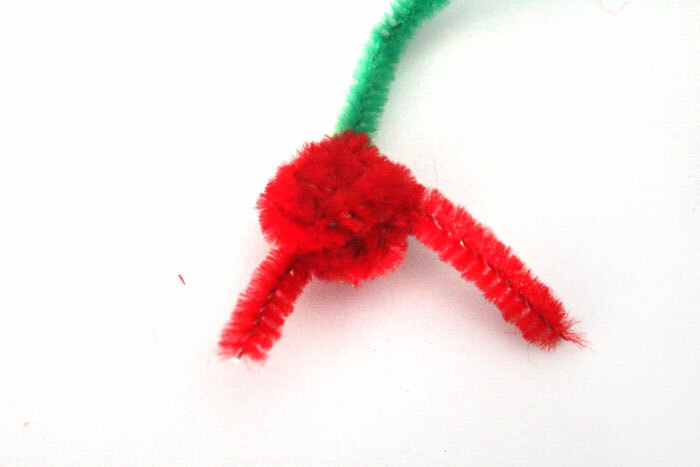 Wrap your pipe cleaner around the initial knot to form a ball. 8. Keep wrapping until you reach the end. Once you do, tuck in that end to hide any sharp edges. 9. Repeat steps 5 and on for another cherry. 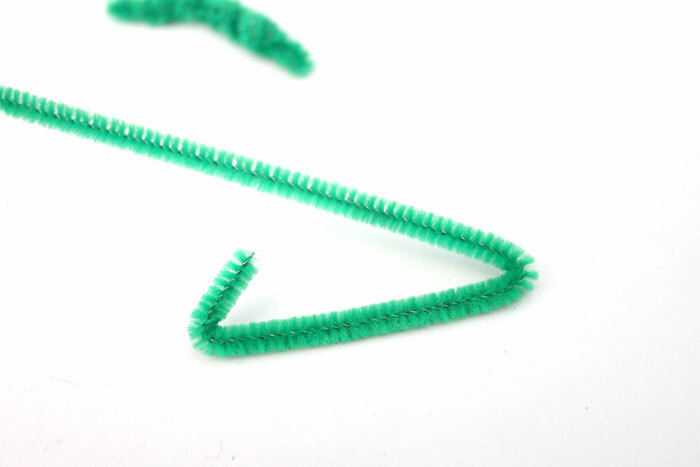 By step 6, instead of attaching a new pipe cleaner, attach the other half of the V from your first pipe cleaner. 10. For the peas, I made a ball the same way I made the ball of the cherry. 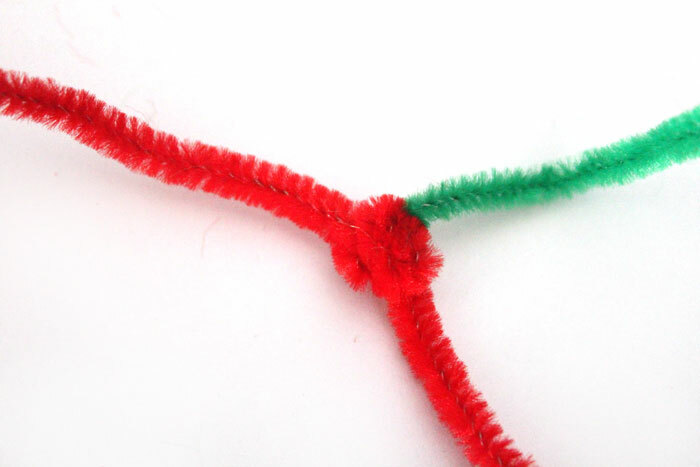 I tied a double knot in the middle, and wrapped pipe cleaner around it until I was satisfied with the size. I love that it was made for literally pennies and complements toys he already owns. 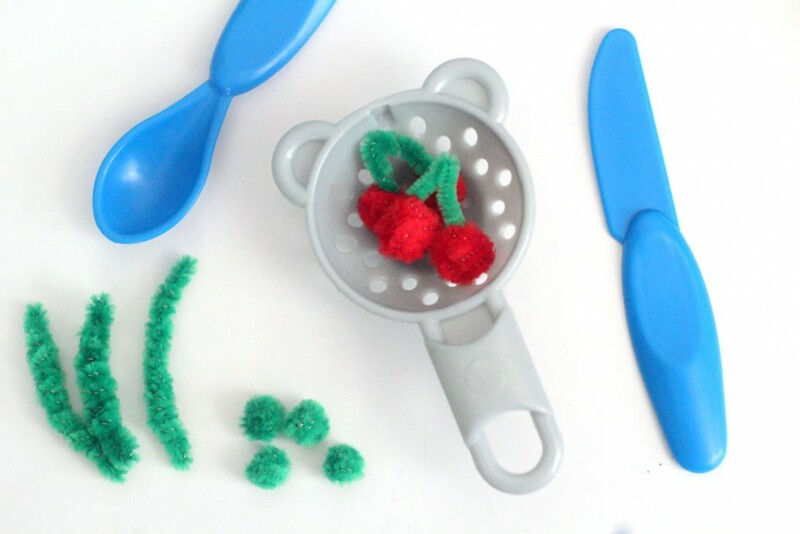 I hope to make some more pipe cleaner pretend toys, but meanwhile, what do you think of these pretend play foods that are healthy too? M loves them!